Studija was a member of the Eurozine network from April 2010 until September 2018. 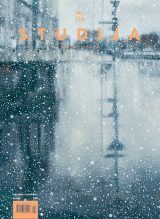 The bi-monthly visual arts magazine Studija has been published since 1997 by the publishing house Neputns based in Latvia. It is one of the most important art magazines in the Baltic region. It has been bilingual Latvian/English since 2009. Studija‘s initial aim is to reflect art events in the Baltics and create a critical platform for discussions about contemporary art processes. The journal offers art reviews, art market analysis, interviews with world famous curators and artists. It touches upon various theoretical problems and evaluates the most significant world art events. Since 2009 until recently, its editor-in-chief has been artist Liga Marcinkevicha. Her approach has brought freshness to the magazine. Humour and wit are typical features of every issue, challenging the reader and adding true value to critical art writing. New editor-in-chief is Inga Bunkse. Studija’s last print issue came out in December 2017. Has the 20th century ended?